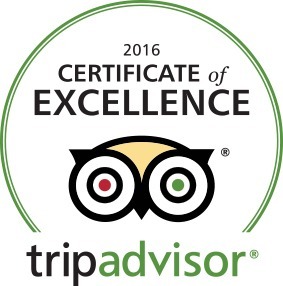 PRIME SAFARIS & TOUR WINS A SECOND TRIPADVISOR CERTIFICATE OF EXCELLENCE IN A ROW! Home>>Posts>>PRIME SAFARIS & TOUR WINS A SECOND TRIPADVISOR CERTIFICATE OF EXCELLENCE IN A ROW! TRIPADVISOR has rose of recent to be one of the famous safari advisory sites based on real experiences that world travelers have always had at certain destinations and with a range of travel organizers. Prime Uganda Safaris and Tours Ltd is such a gifted travel company that it is again receiving the trip advisor certificate of excellence having got the same in 2015. Prime Safaris and Tour has since its inception maintained a professional conduct and kept its dedication to serve according to the expectations of Uganda Safari undertakers including those on safari in Rwanda which in turn has won it considerable positive reviews on Trip Advisor. With a count of seventy nine (80) authentic reviews of which sixty five (66) are graded as excellent and nine (9) graded as very good on its TRIPADVISOR Page, the 2016 Certificate of Excellence awarded to Prime Safaris is by no means an ordinary one. The company sells Uganda Tour and Rwanda Safari packages along with accommodation reservation and vehicle hire service. The dedicated consulting team at the head office led by Sam, Cate and Simon would work 24/7 to ensure fast response to the travelers’ interests while the guiding team led by Dennis, Mark and Joseph work devotionally to surpass the expectations of any traveler on safari in Uganda with Prime Safaris & Tour Ltd. The comfortable safari vehicles equipped with Air conditioning, pop up roof for open viewing and uninterrupted photography, First Aid kit and battery recharging extension always make the short and long drives on smooth and rough country side roads a memorable experience of its own. The range but keenly selected hotels and safari lodges for the stay of our esteemed travelers in all travel categories of budget, midrange and luxury contribute greatly to this ranking as well. The service quality and the quality of the facilities form the center of our lodge selection. The guests’ dietary requirements are keenly taken care of while customized service may not be missed at our selected lodges. Explore Uganda and Rwanda with experts! Prime Safaris & Tour Ltd is your gateway to these destinations and whether you are interested in gorilla safaris, wildlife tours, adventure travel or culture and heritage tours feel free to send your inquiry to the team of experts for ultimate consideration. Your satisfaction will be evidenced by an astonishing review on TRIPADVISOR.